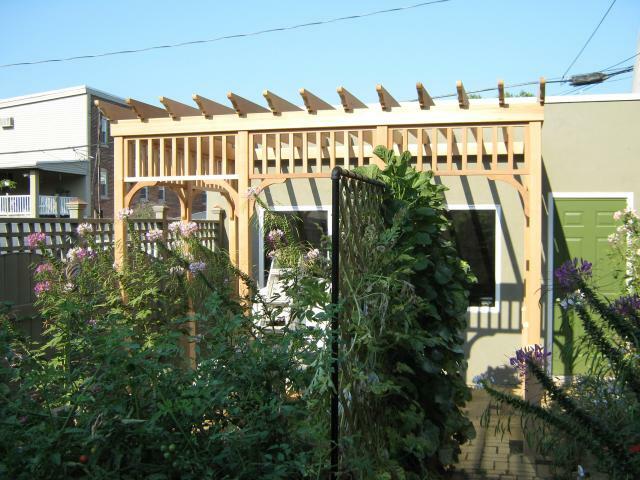 We recently began building a pergola in a cozy back yard of a downtown Lancaster residence. 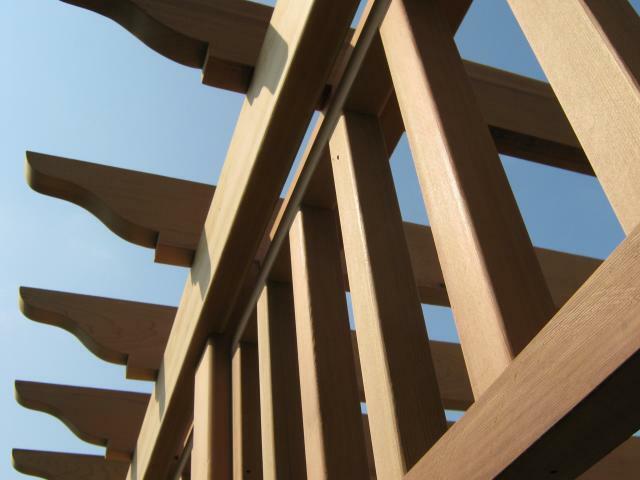 The clients had a basic design idea for the appearance and were hoping to have it constructed of western red cedar if the budget allowed. 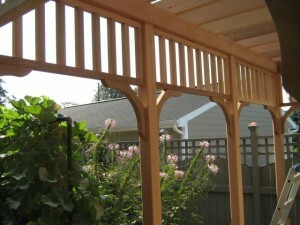 The garage wall the pergola was being built against had vinyl siding on it which the clients did not care for. 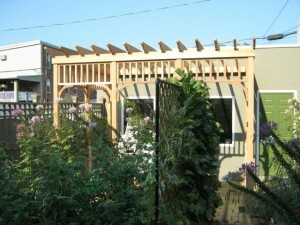 I recommended we put a new cladding on the wall since it would be very inaccessible once the pergola was constructed. We settled on Flexlite, an acrylic stucco system which is maintenance free and has a very pleasing stucco appearance that blends well with both contemporary and older building styles. It's also available in custom colors and can be ordered using any Sherwin Williams color! Initially I designed the perimeter beams in 6x6 which most closely matched the original design, bu, the cost of the materials was well over $4k which blew the budget. After playing with the design and building the beams of 2x6 as well as some other modifications to reduce the amount of cedar we got the materials around the $2.5k mark and proceeded with the project. The first step was to mark out the locations for the posts, dig holes and pour concrete piers that extend below the frost line, 3 feet in this region of Pennsylvania. 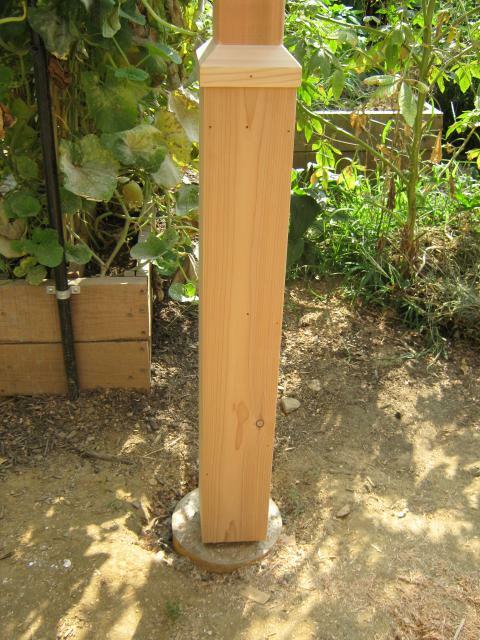 Once the piers were set I then marked out my exact post locations on them and bolted a galvanized steel post base on each pier using wedge bolt anchors. 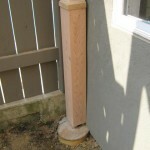 We weren't concerned with the appearance of the galvanized post base since they would be covered with cedar when we wrapped the bottom section of the post with decorative trim. I also used a rotary lazer and transit to measure the height variations in the piers so I could pre-cut and notch all my posts to length down to 1/16 inch accuracy. 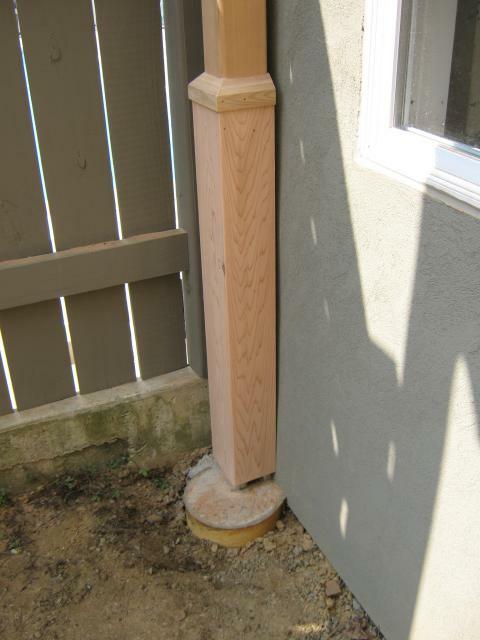 The post is plumb, the garage wall isn't! This type of scenario always presents tough choices...build it plumb or built it to the existing? While I prepped all the posts my helper worked on cutting the patterns in the ends of the rafters and cutting the corner brackets on a band saw. Prepping the posts took quite a bit of time because in addition to cutting them to length and notching them to receive the beams I routed channels in them to receive the cap mouldings about 1/3 of the way up the posts. 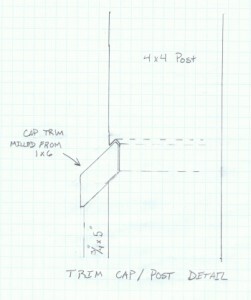 Recessing the cap moulding into the post prevents water from getting trapped between the wood and accelerating decay. We designed the beam and the decorative spindle frames below them so that water could easily drain out from between the beams and not be trapped between them. In order to maintain a nice clean look with minimal nail or screw holes I used 8 inch TimberLok heavy duty wood screws to fasten from the top of the rafters down into the beam. Later in the project I was sitting on the rafters to reach the outside of the beam next to the fence and was very pleased with how rigid the rafters were held in place since the clients weren't interested in having any purlins, cross members running perpendicular to the rafters, that could have helped keep the rafters from trying to lean over. The clients will be installing a new stone paver patio and walkway as well as coating the structure with a deck oil to prevent the wood from turning gray. We'll be back for updated pics later! "Our back yard problem is solved. 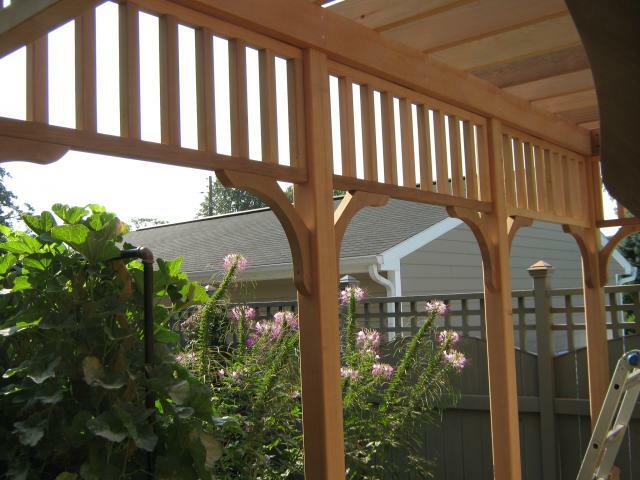 Owner, Owen Sechrist, of Ruby Construction designed and constructed a beautiful western red cedar pergola as only a cabinet and trim installer could do. Because its attached to the face of our old garage, he suggested a facelift with new windows and a Flexlite masonry (custom color) finish, looks great. A pro's touch were the water shedding cedar cap strips on top of the post cladding (bottom half). His cedar prices were lower than any I could find. Thanks Owen for a great job. We love it!"